This blog looks at the Windsor lines, around Twickenham, Richmond and Putney, in South West London, outlining a proposal that would dramatically improve transport in the area. The Windsor lines are the route from Waterloo to Staines and on to Windsor and Reading in South West London. The key problems that they suffer from are a large number of level crossings and a low frequency service. Level crossings are a huge problem to the modern railway. They are a real accident problem given the relative safety of the rest of the network. Eliminating level crossings is now considered a key railway safety issue. However, in South West London, the issue with level crossings is less about safety and more about congestion. These are heavily built up areas where car ownership and use is high. Over recent years, the level crossings have become a battleground, with vocal campaigners resisting increases in the rail service because it would mean the barriers at level crossings would be down more and more. The prime case of this is at Egham, where the Airtrack Heathrow rail proposal was heavily opposed as it would increase the amount of time that the crossings were blocked. This blog is focussed on Twickenham to Clapham Junction however. Here, there is a four track railway from Waterloo to Barnes with no level crossings (there is a short 3 track section in the Battersea area, but that is relatively simple to fix). Beyond Barnes, the railway splits, with tracks going via Richmond/Twickenham and 2 tracks via Brentford/Hounslow. Both of these lines have level crossings, but the Barnes to Richmond section has 4 in less than 3 miles. Although Barnes to Richmond does benefit from a number of bridges, the level crossing barriers are still a problem. Increasing the rail service frequency would cause the barriers to be down even more, and that would not be acceptable to the local residents. As it is, traffic flow in the area is poor, especially considering that the parallel road is the A205 South Circular trunk road. The congestion also affects local buses. The current frequency of service is 4tph (trains per hour) slow all stations on both the Hounslow and Richmond routes, creating 8tph from Barnes inwards. In addition, there are semi-fast and fast services down both lines. All types of service are restricted by the available lines, both from the level crossings, and the mixture of slow and fast services west of Barnes (east of Barnes, the fast trains have two dedicated tracks). The effect of these constraints is that it is impossible for anyone to board the train at Wandsworth Town during the high peak period - the trains are full. By comparison, the South West Main Line has 18tph slow all stations to Wimbledon, emphasising how poor 8tph is for a similar population density. Widening the line to 4 tracks is not possible, as the section from Richmond to Barnes has houses just a few metres from the track on both sides. Building bridges or underpasses is similarly difficult, requiring major demolition. Lowering the track would require closing the railway for 18 months, which would affect the journeys of travellers over a large area. Thus, solving this combination of problems is not easy and not cheap. The Richmond crossing proposal consists of a step-by-step approach to the problem. Step 1 - Build a new 2 track tunnel from east of Barnes to east of Twickenham. The tunnel would be designed for the fast services and would have no stations (an underground two platform station at Richmond may be desirable and is an optional part of the proposal). Step 2 - When the tunnel opens, the line between Richmond and Barnes would be closed for 18 months. During that time, the railway would be lowered into the ground, removing the level crossings and effectively creating a cut and cover box along the key section between Barnes and North Sheen. The stations would be rebuilt. The new tunnel would take most of the trains during the closure, so only stations between Barnes and Twickenham would be directly affected (use of the District line or bus would be required for this period). It may also be possible to run a Richmond to London train reversing at Twickenham during this period. Step 3 - Reopen the line and enhance the service. The end result would be the equivalent of a 4 track railway all the way from Waterloo to Twickenham - 2 fast tracks (including the new tunnel) and 2 slow tracks (including the cut and cover box). There would be no level crossings on the key section through Richmond, and no conflicts betwen fast and slow trains. The net effect is the ability to run a much higher frequency service with greater reliability. For example, here is a possible service pattern. This gives 16tph slow all stations from Waterloo to Barnes, 8tph on both the Hounslow and Richmond slow lines, and 12tph fast to Twickenham. 12tph would use the new tunnel and 8tph the cut and cover box. The proposal is by no means cheap, probably between £500m and £1bn. However, on the benefit side it does radically enhance the rail service, as well as relieving congestion and enhancing local buses. On completion, the new lines would not be full, so further increases in frequency (to tube levels) would be possible if demand warranted. This proposal outlines a proposal that uses an express tunnel and reconstruction of the existing track to dramatically improve the transport system of the Richmond area. While not cheap, it is perhaps the cheapest scheme that can deliver this degree of benefits. If you back the proposal, or have any other opinions, why not leave a comment! You're certainly right to say that level crossings curse this section of railway - not just in the London suburbs but at Feltham, Egham and Wokingham too. Your ideas are certainly innovative, but I fear the high cost and disruption you mention would mean it's unlikely to get anywhere for a long time even if it had a positive BCR. At present this railway is being rebuilt to allow 10 cars (potentially a 25% increase in seating) and it may be possible to achieve 12 cars before long, especially with selective door opening at certain constrained platforms. There is no problem with 12 car trains at Reading or Waterloo. This isn't a cheap upgrade but it will only cost a tiny fraction of the sum required for a 3 mile + tunnel. Obviously even 12 cars may not be enough ultimately if passenger numbers continue to rise. I think there is indeed scope to introduce a tunnelled section, but I don't see why it needs to start near Twickenham. And missing the existing Richmond station is a bit self-defeating (underground stations jack up the costs). Only 11 trains currently pass through Richmond between 0800 and 0900, and as you rightly observe this is as high as 18tph on the two slow tracks at Earlsfield & Wimbledon. A more modest bored tunnel commencing about 2000ft East of Richmond's platform ends (just before Manor Rd) and running some 9,500ft to emerge West of Barnes station would do a pretty similar job for less money. It would take a TBM about 35 weeks to bore one tunnel. Allowing time for the TBM to be reversed, it should take about 1.5 years to complete both tunnels. Luckily the railway land on the necessary sections appears to be just about wide enough to sink two ramps and retain two running tracks. I estimate a formation width of 55 - 60ft is the minimum required. The gradient at the Barnes end would be quite steep, but no worse than 1 in 40 - which is fine for modern EMUs. I doubt a steam charter would be allowed in the tunnel! Thanks for your comment. I agree that the trains can be lengthened to provide additional seat/space capacity. Thats why I'm pitching this as being as much about path capacity (tph). My basic tenet is that areas like Putney should receive a high frequency tube-like service - they are not fundamentally different in population density to areas around the Northern line just a few miles further south. (ie. I think there is too much focus on "capacity" as seats/space, and not enough on the service people receive as tph). I originally looked at a tunnel portal east of Richmond, and you're comment has some good analysis of that. My take was that it would leave Richmond station as a constraint. The plan I outlined separates fast and slow services, partly to speed up the fasts (which are very slow from places like Wokingham) and partly to provide space for a frequent Heathrow service. To reach the desired service pattern with its mix of fasts and slows requires 4 tracks up to the first real junction at Twickenham. It might be possible to widen above ground to 4 tracks between Twickenham and Richmond, however Richmond itself is a real problem. My site visit showed the presence of a large built up slab above the 2 tracks which I don't consider replaceable in that urban environment. Thus I went for the longer tunnel, and skipped Richmond station on the fasts (justified by having a much higher frequency local service with Twickenham as the junction). Either way, short of long tunnel, this is an area which could really do with receiving a proper tube-like service. Thanks again for the comment. Agreed that the (1960s?) concrete box at the West end of Richmond station is a real irritant, as creating extra tracks at that point would be hugely expensive. And I also agree that there will be a significant element of surpressed demand on the route due to lower than ideal frequencies and overcrowded trains at present. But I don't think that such vastly increased frequencies would inevitably produce a trebling of passengers to justify it, especially as the line terminates at Waterloo rather than crossing Central London as tube lines do. Also Richmond is an important interchange for the District and NLL and I doubt passengers from Feltham and all points West would enjoy the prospect of an enforced extra change at Twickenham. Operationally such increased frequencies would probably be impossible to path due to the flat junction at Barnes, the three at Whitton and the one at Staines. The reason 18tph can be squeezed between Clapham Jcn and Wimbledon are the flying Jcns at Raynes Park, New Malden and Hampton Court Jcn which avoid conflicts. On the Windsor lines only the Kingston loop has the necessary infrastructure to do this at the moment, so you would need to build these as well. And the extra frequencies you propose would cause problems at the three level crossings on the Hounslow Loop and the one at Feltham. This is why lengthening trains is the preferred option for this route. Longer trains only close the road crossings for a few extra seconds, whereas every extra train pathed closes a crossing for an extra two to four minutes. Look at the furore at Egham caused caused by the Airtrack proposal. Its hard to see a cheap and easy way to increase the frequency at the inner stations. The only thing I could suggest is a 4TPH all stations shuttle from Waterloo terminating and reversing at East Putney. This of course would require the rebuilding of the Point Pleasant flyover (which I remember going over in 1981 on 'The Wessex Deltic'. Alternatively rebuild Barnes station, expanding to the South to create a terminating platform for the 4tph from Waterloo. But for Mortlake and North Sheen longer trains look to be the only answer without closing the level crossings! The frequencies proposed above are actually quite low, just 8tph on each of the Hounslow and Mortlake routes. The recent London Overground launch shows the supressed demand - http://www.londonreconnections.com/2011/peeling-the-orange-usage-stats-on-the-london-overground/ - massive growth in usage is highly likely. I agree that a fast line station Richmond is desirable, but I think we agree it requires either tunnelled platforms or major demolition in an urban area. I believe the frequencies I propose are valid operationally. I thought (although can't prove right now) that there were some non-stoppers via the Hounslow route. So, those disappear to the new fast route to be replaced by the new slows with no real level crossing impact (Wood Lane LC could also be easily bridged with non-residential demolition). Whitton junction gets 2 more services per hour and 12tph total, which should be possble considerig Thameslink will have 2 flat junctions handling 24tph. Barnes junction would be resolved by the tunnel portal as would the first level crossing on the Hounslow route. I think the Point Pleasant flyover is also interesting, but only benefits Wandsworth Town. I prefer it as an extension of the SLL overground, but that also gets complex, so isn't top of my list of proposed projects. I've had a good look at the Richmond - Clapham Jcn section this week. The good news is that most of the 10-car platform extensions are complete or nearly so ready for the rebuilt class 458 fleet. Thankfully the 1960s concrete box at Richmond was designed with just enough width to allow full 12-car platforms in future. The bad news is that there is a housing development being built on the land immediately South of Barnes station, meaning no space to easily allow tunnel portals and extra tracks, or a turnback facility. My idea of running rush-hour Waterloo-East Putney shuttles would of course benefit Putney residents too. The two Putney stations are only about 5 minutes walk apart. A quick calculation suggests that 3 trains could provide a 4TPH frequency - perhaps a good use for some of the stored class 508 units? There is no doubt that the 10 car trains will help, but they don't address the service level issue (why do North Londoners get 20+tph, but South Londoners are supposed to be happy with 4tph?). Having looked at this route as well I came to the conclusion that the best solution was to turn two of the four tracks between Clapham Junction and Barns over to an extended Northern line. Past Barnes the Richmond line would also be given over to the tube line down to Witton Junction. From Witton their is space to four track the line to Feltham where the tube would terminate with a connection back to the Windsor lines services, which would now all run via Hounslow. The problems with four level crossing, would require the bridging of the Sheen and Mortlake. The Barnes one could just be shut and replaced with a footbridge, as it gets very little traffic and their is a bridge just a couple of 100 yards to the east. That just leaves the fourth crossing, which is again very low use and could be be replaced with a restricted height fly under for cars or another foot bridge. Service wise I was thinking 12tph to Feltham, 12tph to East Putney as the inner turn back. The Hounslow loop service would be withdrawn, as both sides of the loop now have increased service. The Kingston Loop with terminate at Twickenham, longer term the Overground could be extended from Richmond to Kingston with a a flying junction at Richmond. The problem with using the Northern line is capacity. The Northern line today is over-capacity to the point that people cannot board at the Clapham stations. The split and new branch to Battersea Power may make things worse - it introduces a whole set of new people onto the tube. It will certainly make the section north of Kennington worse (and the slightly less busy Kennington to London Bridge section is necessary to leave enough space for the massive amount of boarders at Bridge. Trying to extend from Battersea to Whitton is thus a complete non-starter - the Northern doesn't have anywhere near that capacity. BTW, I think that bridging the level crossings might be technically feasible but very disruptive. Also, a flying junction at Richmond is highly unlikely (highly expensive area, and major slab restricting it to 2 tracks). The flying junction East of Richmond Station was once part of the Cross Rail plan when it was suggest to head down to Kingston. Their is plenty of space for this. Having thought about this a little more I think the plan to extend the Northern City line to Waterloo and then down to Feltham makes more sense. I've posted this on your swanlink post. A new express tunnel would have to have a station at Richmond, it is too an important a Station to Miss. I think it would be better to combine it with a simplified airtrack scheme to Heathrow. From experience the really crowded trains on the main route are the semi fasts, the slows have standing room still. So Staines, Feltham, Twickenham, Richmond, Putney and Wandsworth Town are the busy stations. Hounslow loop from Brentford can be crowded but it is those expresses that Ginza level. I would run 4tph from Heathrow, mirroring the Reading calling pattern. I would not bother with anything further west as they both have further level crossing problems and lengthening will take care of most of their problems, besides the four extra express will relieve the worst crush from both of these. I'd start off with just an extra 2tph to Hounslow via Brentford and 4tph to Shepperton. That would still be an 12tph on the slows, with 12 on the fast line (if the Shepperton line trains run that way. If the Whitton triangle still proves problematic, then curtail the Weybridge train back to a shuttle to Staines like it used to be and have that train become part of the Hounslow loop. Sure people going to Hounslow from the West will now have to change at Whitton, but most local journeys are taken by the much cheaper bus and with the increased frequency on the loop interchanging won't be such a problem. The service pattern outlined above looks reasonable, although a key goal is to have at least 8tph (preferrably 12tph) on the slows to Richmond, so as to be similar to the tube in turn up and go frequency (how people treat the Northern line for example). I agree that this scheme works best with a link to Heathrow. 4tph from Heathrow to Waterloo would be a major boost to the area, and as you say would aid outer London commuting. As you say, this is expensive. Why not use existing plans to solve these Windsor line problems. The SWML is - at some point - going to have to have that extra 3rd reversible fast line between Surbiton and Clapham Junction & Waterloo. If you're going to do that, then you might as well go the whole hog and put in two extra fasts, but that's another story. - Reinstate the missing curve at Virginia Water and grade separate Weybridge and run the Reading trains on the SWML and then via Chertsey. With the extra SWML capacity there's space for these trains. - Connect Crossrail from Old Oak Common to Acton Central and then have a branch to Feltham at 4tph and onwards to Egham and Windsor at 2tph each. Capacity on the Windsor line through Richmond solved. Also, capacity through Egham freed up to allow Airtrack to proceed. My sources sugggest that a 3rd reversible line isn't terribly useful. You need to get trains out of London as well as in during the peak, otherwise you end up with a big car park. I've looked at whether you could add 2 more tracks, and you mostly can, but with a Network Rail estimate of £1bn for just 1 extra track, its likely that the cheaper option is a non-station tunnel for the fasts from Surbiton to east of Clapham Junction. (Tunnelling is relatively cheap, stations are now the expensive bit). Were there to be 6 tracks on the SWML, there might be enough spare tph for some diverted Reading trains, but I suspect less than might be thought (as adding another "branch" increases the risks of unreliable services, reducing the effective maximum tph). Crossrail 1 to Feltham isn't a bad notion, but all the signs are that Watford is pencilled in for those trains. Well, whatever is done about the SWML, the capacity will be increased with more tracks, which means there's capacity for Reading trains via Chertsey too. Crossrail has 14tph turning back at Paddington by the current plan. That's plenty to do both the WCML and via Hounslow. Just stumbled across your blog and proposal, not long after i'd had a very similar thought. My suggestion was a 4-track, tunneled section from barnes to the west of twickenham (where it would split and join existing lines at whitton and strawberry hill). 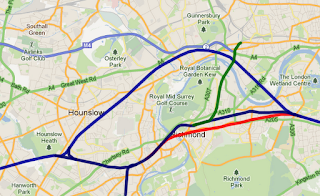 From what i've seen of the talk around crossrail 3, this could eventually form part of that plan, Part-funded by housing, I suggested the route between twickenham and richmond would be converted into the Richmond Borough Through-Line park, utilising the existing cutting/bridge to provide a high-line style park and cycle superhighway. The problem is not easily solved. Firstly the LSWR chose an ancient right of way between common grazing between Barnes and Mortlake, thus avoiding Tescos etc. This was previously the site of Prtobello House which bounded by Howgate Road, Vernon Road, Sheen Lane, and South Worple. The estate was eventually decreed to Barnardos,. At such time the thing ought to have been rethought. As someone who has a detailed knowledge of the area. ; I'd be happy to add proposals here. I'm uncertain how to contact relevant parties; so if anyone has any ideas please contact me.